This review is superfluous, because if you live in San Francisco, you have been to Tartine Bakery. You have stories about the levain, or the morning bun, or the bread pudding. You tell tales of Saturday mornings in line at 7:30 a.m., but it was all worth it, because you got that perfect frangipane croissant. What do you want me to say? On average, this is probably the best bakery in the country. They’re the best at bread, for sure. Do they put out consistent innovation like Dominique Ansel? Nope. How about amazing jams on brioche, like SQIRL in LA? Not their specialty. But, and I swear to god I’m not exaggerating, this is the best bread in existence. Honestly, hit me on Twitter. I’m @mlchild. Tell me if there is better bread in the the Continental 48. I have tried it all. I have been a bread obsessive since I was six years old. This is it. This is the the alpha and the omega. I don’t know what they do with their bread here, but it liquefies in your mouth in a way that’s almost unbelievable. And the flavor — it’s incredible. It’s no surprise that the fundamental recipe for Tartine bread is 37 pages long (poetic license). E = mc^2 was concise, but bread is much more complicated — temperature, humidity, and other factors are in play. These guys have nailed it. What do you want from this review? 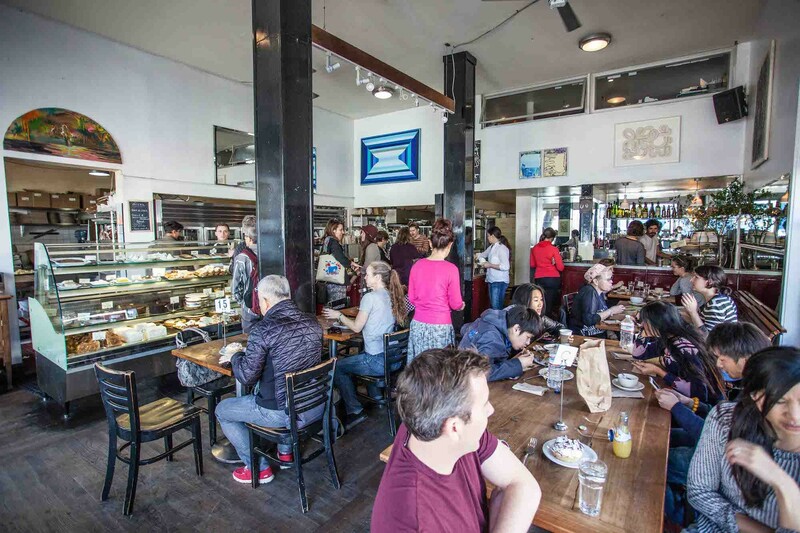 Are you visiting SF and considering waiting in the legendary Tartine line? If so, it’s probably worth it. If you live here, you already have a strategy (weekdays, early). But if you’re worried, the hype is not a lie. Make sure they heat it up enough so that the cheese is properly melted. Otherwise, you get cold cheese and asparagus upon the famous bread. You want that hot cheese. Trust me. I’ve seen so many ripoffs of this across the nation. None are better. Not one, not two, but THREE cheeses in this bad boy. Good stuff but the bread is the essence. Aight, but not great, which can be the case on a number of Tartine pastries. They appear to suffer from the essential pastry problem — a one-minute-old croissant from a mid-range baker is better than a one-hour-old one from Tartine. Time is of the essence, and this is usually a bit aged. As noted above, what matters is how fresh it is. But this thing is a technical masterpiece regardless. It’s cake. Do you like cake? Thought so. Sure, could have used more passion- fruit flavor, but, again, it’s cake. Yank Sing is a classic spot to stop for dim sum in SoMa.